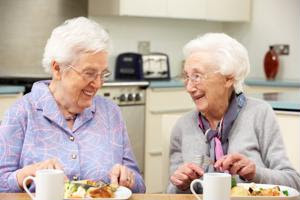 Follow these tips to keep the kitchen safe for your senior clients. Cooking fires are the most common cause of house fires and house injuries, according to the National Fire Protection Agency, so never leave the kitchen unattended while cooking. Try to avoid appliances, like coffee makers, that automatically begin cooking. When cooking, all pots and pan handles should be turned so they aren't sticking out over the edge of the stove. Move any items seniors use most out of the highest and lowest cabinets and shelves, and into easily reachable cabinets and drawers. Consider installing pull-out drawers for bottom cabinets to limit the amount of bending seniors have to do.If needed, countertop heights should be lowered for seniors who have trouble bending or who are in a wheelchair. Make sure any knives and sharp utensils are secure in their storage area. Keep countertops clear and uncluttered. Close all drawers and cabinets when you're done using them. Make sure any area rugs are secured to the floor with double-stick tape to prevent falls.